After living in Florida for 7.5 years, I finally decided to take a trip to St. Augustine. As everyone said I would, I found it to be charming and educational, full of color, history, and legend with more museums, monuments, castles, forts and attractions than many larger cities. Just across the river, we found the St. Augustine Alligator Farm and Zoological Gardens. It is absolutely delightful and ideal for both children and adults. Founded in 1893, the alligator farm earned accreditation with AZA (American Association of Zoos and Aquaria) in 1989. AZA is a very stringent organization that demands the highest of standards from its members. Since only 2% of all animal attractions nationwide merit this honor, when I saw the emblem at the entrance, I knew that even the most exacting visitor would be pleased. 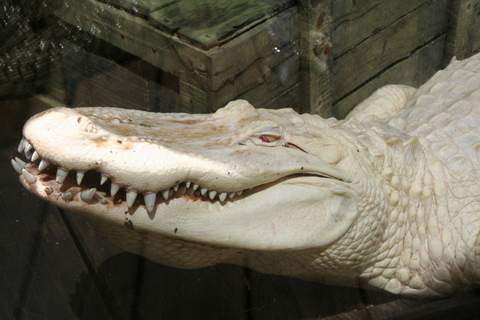 Have you ever seen an albino alligator? He’s the first animal you’ll see upon entering. A bright white, he and his kind hail from the bayous of Louisiana and legend has it that good luck awaits those who look at him. There are baby albinos as well. I learned a lot about crocodilians (alligators, crocodiles and their relatives) at the Zoo’s Land of Crocodiles. This is the only facility on the world where you can see all 26 living species, including the Chinese Pigmy Alligator, the Nile Crocodile, South American Caimans and my favorites – the rarest of all - the long-snouted, fish-eating Gharial from India. The Gharial is in an enclosure built especially to help him breed to increase the numbers worldwide of this rare and endangered animal. Are you interested in seeing really enormous monsters? Maximo, the zoo’s largest resident, won’t disappoint you. He is a fifteen foot, three inch, salt water crocodile. Maximo can be seen from an underwater viewing station. Even more astounding is Gomek - now stuffed and mounted - one of the biggest crocs ever seen in any zoo. As he was almost 18 feet long and weighed nearly 2,000 lbs. I found myself a bit relieved that he is no longer with us. The attendant assured me that he did live a long comfortable life here - which sometimes means 80-125 years! But even Gomek was small compared to some of the prehistoric specimens we saw in the impressive fossil collection. Eggs, bones, recreations and charts showed dinosaur and crocodilian evolutions. Some were 50 feet long and their awe-inspiring skulls are on display. Many mammals are here, too. I loved the marmosets and monkey-like lemurs. Rare types of squirrels, colorful parrots, and a cassowary - the world’s most dangerous bird which can kill a man with one kick - will amaze you. Speaking of birds, surely the highlight of your visit will be the Bird Rookery. You will be astounded as you follow a wooden walkway above a lagoon filled with hungry alligators. The walkway winds through trees full of squawking herons, egrets, spoonbills, ibises and storks that are breeding, building nests, raising their young and hatching eggs. I was able to get so close to a heron’s nest that I could see the eggs. A visual paradise for photographers, the best time to see these birds is between March and June. For those seeking more fun and thrills, two recently installed ziplines are sure to please. There are two difficulty levels. Your bravery is tested as they pass over crocodile-infested waters! Many wildlife demonstrations and animal feedings are scheduled throughout the day and the website is very helpful for large groups, education trip planning and advance purchases. All in all, I think you will find that the St. Augustine Alligator Farm Zoological Park ranks high among the city’s great attractions. The St. Augustine Alligator Farm Zoological Park is located at 999 Anastasia Blvd., St. Augustine, Florida 32080.